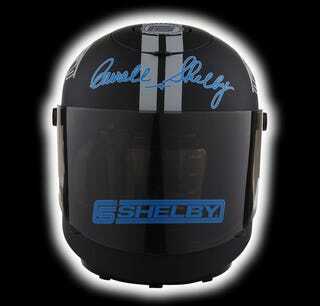 Carroll Shelby is a name that's lost some luster over the years. Now that name is going onto a coffee maker. OK, that's it, the luster's completely gone. The Carroll Shelby racing helmet coffee maker is a racing-helmet-shaped 10-cup automatic drip machine featuring Shelby's signature, corporate logo and dignity. "Shelby fans can now make their passion for cars part of their morning routine and daily coffee breaks." - Tracey Smith, vice president of Carroll Shelby Licensing. "We're excited to launch the Shelby Racing Helmet Coffee Maker with legendary racing icon Carroll Shelby,the striking Shelby Racing Helmet Coffee Maker not only makes a great cup of coffee, but brings the excitement and feel of race day into the home or office." - Andy Herbst of Global Coffee, Inc.
We'd like to get off this ride now.